Occupation: Adventurer, scientist employed by U.S. military. Story: Jonathan was the son of a watchmaker. When Jonathan's father saw the bombing of Hiroshima in a newspaper he decided that repairing clocks was obsolete. The future was in nuclear physics. He therefore stopped his son's education in clocks and made him study physics. In 1958 Jonathan had a Ph.D. in physics. He started at the research center at Gila Flats in may 1959. In august 1959, when retrieving a watch for his girlfriend Janey Slater, he was accidentally trapped in the test chamber at the lab. In the test chamber they removed the nature field, dissolving Jonathan. During November 1959 the particles that was Jonathan slowly reassembled ending on November 22nd. Jonathan was given the name Dr. Manhattan, after the Manhattan Project. 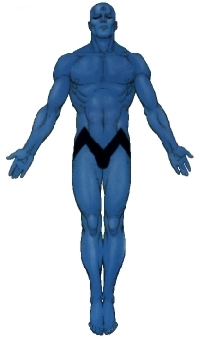 In the following years Dr. Manhattan worked as crime fighter, as Pentagon thought it would be good for his image. In 1971 president Nixon asked Dr. Manhattan to enter the Vietnam war. Dr. Manhattan won the war for Nixon in two months. Skills & abilities: Jonathan controls material on atomic level. This includes moving particles by teleportation. Philip Solar: The original Dr. Solar, Man of the Atom from Gold Key. Similar powers.